Pain in the right part of your abdomen can pinpoint to some of the conditions which may need urgent medical care. This type of pain can be caused by an infection, stone presence, bowel problems, etc. Since there are plenty cases that can be the potential origin of the problem, it is important to diagnose the right source of pain. What Causes Pain in Right Side? Usually, the pain comes from the inflamed and irritated organs or organ capsules. It can trigger the nerve endings and end up in pain which can be a precise or generalized pain. In order to pinpoint the pain location, the doctors have divided the stomach into 4 quadrants with two axes going through the belly button at 90 degrees. The upper left and right quadrant and the lower right and left quadrant. Each of these fields has a specific organ which can be targeted with present pain. 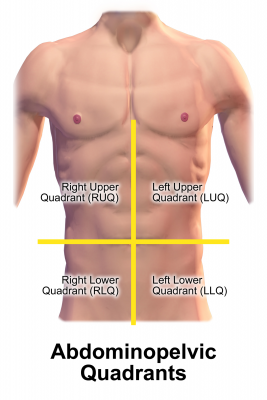 What Are the Organs Present in 4 Quadrants? For the doctors to identify the source of the pain, they have to know the organ corresponding place above the skin. This can ease the further diagnose process. Possible Causes of the Pain in My Right Side? 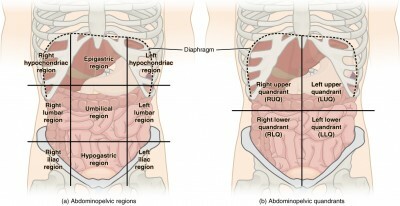 Now that we know all the organs that can be found on the right side of the abdomen, we can list all the possible causes of pain on the right side. Coming from the surface, the pain can be located from the skin, muscle and ribs, all the way to the deep tissue which covers the organs and vessels. The area is usually inflamed and it creates inflammation fluid with substances that irritate the pain receptors. Here are some of the most common conditions resulting in pain. One of the most common source of precise pain in the right lower part of the abdomen is the inflamed appendix – appendicitis. This is when the feces or other substances irritate the appendix which gets inflamed. The bowel mass can be stuck in the appendix constantly irritating the tissue resulting in inflammation, pain, and swelling in this area. The pain can radiate towards the leg and to the upper part of the abdomen. It is treated surgically since it can burst and cause a fatal condition such as peritonitis. Other accompanied symptoms are fever, nausea, and swelling of the lower-right part of the abdomen. The kidney stone is a condition which can result in one of the most painful sensations. It can be severe and radiate from the back to the front part of the abdomen. Other present symptoms can be painful urination, blood in urine, nausea, vomiting, fever and excruciating pain in the back and whole abdomen. Some people excrete the stone if it’s smaller, others undergo surgery. Nowadays it is often solved with Shock Wave Lithotripsy (SWL). Gallstone is another condition which can cause severe pain, especially after a fatty meal. It blocks the bile from getting into the stomach and interferes with digestion. The pain is usually located under the right side of the ribs and onto the shoulder. Other symptoms can be nausea, vomiting, fatty stools, and sweating. This is also usually treated surgically and needs medical attention. An ovarian cyst is often in older women where it can be present even without any symptoms. When it causes rupture of the cyst, it can be followed by sharp pain in the area of the ovary. It can radiate towards the right leg and the person can feel nauseous. It is not rare if it is accompanied with vomiting. This is a condition when the egg fertilization occurs on the outer part of the uterus. This is often at the place of fallopian tube or ovary. This is not a normal situation and the embryo may cause problems while growing. It can be followed with sharp pain, vaginal discharge, and light vertigo. This should be a potential cause when these symptoms are present with over 10 weeks of missed period. It should be treated surgically and in most cases, these kind of pregnancies are not possible. This is a condition which is a long-term condition affecting the bowel movement. It causes bloating, cramping, abdominal pain, diarrhea, constipation. The symptoms subside after voiding. Some women have a painful period where the pain can be sharp stabbing pain coming from the uterus to the abdomen, radiating towards the upper part of the stomach. Some women may need over-the-counter meds for the pain. This type of pain is caused by chronic bowel inflammation which can be in a form of Crohn’s disease or ulcerative colitis. These conditions cause is still unknown, but the stress and genetics play a big role. It can create wounds inside the bowel tissue which can be very painful. This can lead to poor appetite and also digestion problems. The pain is usually burning and stabbing, especially if there is a bowel content inside, which is the main reason why people avoid eating in these conditions. It is treated with medications and diet for a long period of time. Constipation can be followed by pain and gas creation in the stomach due to bacteria action since the feces is for long in the intestines. The bloating may happen and it will cause discomfort until the feces and gasses are released from the intestines. If the inflammation affects the bladder and the uterus, the pain can be present in the right side of the abdomen. Kidney pain is also possible if the conditions are recurring and if they cause chronic infection. The pain can be overlooked if there are not symptoms such as painful urination which is mostly present. In most cases, the pain which constantly appears or lasts for a long time is by itself enough reason to visit a doctor. If you are having painful periods or you are having gasses, this you should know that it can go away with some over-the-counter medication. If you are having other accompanied symptoms, state that to the doctor which will help in easier diagnosis. If you are vomiting, having severe pain and you see blood in the stool, be sure to go to the emergency care as soon as possible. These occurrences can be fatal and you should not ignore these signs.